The Independence Aquifer in Central Mexico is in a permanent state of decline due to overextraction of groundwater by commercial agriculture. This has led to concentrating dangerously high levels of naturally-occurring arsenic and fluoride – as much as 13 and 15 times the World Health Organization’s recommended limits, respectively. This toxic cocktail is known to cause dental fluorosis and inhibits neural development in children, as well as leading to skeletal fluorosis, kidney disease, developmental disabilities, skin lesions, organ failure, and cancer among long-term consumers. Commercial options for arsenic and fluoride removal – such as activated alumina and reverse osmosis – are costly and beyond the reach of many low-income communities. This is a locally acute – but globally distributed – public health challenge, impacting other economically disadvantaged communities through Latin America, North Africa, and Central, South, and Southeast Asia. 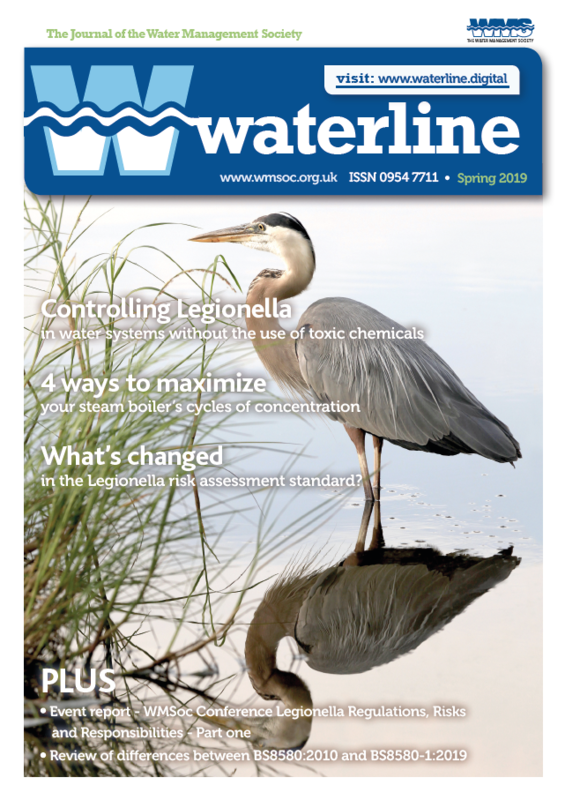 We have worked to prove the treatment capabilities of these media under real world conditions using water samples taken directly from contaminated community wells. This pioneering proof-of-concept work, coordinated by Caminos de Agua, has been conducted in partnership with Engineers Without Borders UK fellowship placements over the past four years, supervised by environmental engineers at NCSU, and supported by the Natural Health Research Foundation. 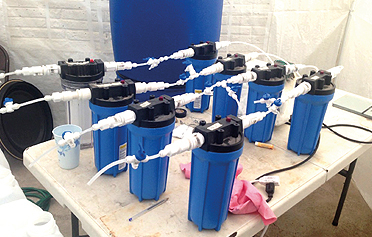 In 2016, Caminos de Agua began working Optimizing fluoride & arsenic removal with gravity-driven sorption contacters by Caminos de Agua closely with Dr. Kearns of NCSU to streamline production of bone char media for fluoride adsorption, design and build full-scale prototypes for in-house column testing using real water, and develop overall testing protocol and guidelines. By mid-2017, the Caminos de Agua team had begun working on lab-scale pilot studies. This work has continued into 2018. We have also been designing field-scale pilot systems that, using locally produced bone char and a commercial arsenic sorbent, remove both arsenic and fluoride from local groundwater. We have also fabricated and tested various locally-produced arsenic sorbents. This report covers the progress of these processes in greater detail. In addition to Dr. Kearns’ support, Dr. Matthew Polizzotto (University of Oregon) and graduate students Maia Fitzstevens (NCSU) and Gabrielle LaFayette (UO) are offering support in the design of tests and trials as well as laboratory resources and university studies. Engineers Without Borders UK volunteers Sarah Mitchell and Simona Dossi along with research fellow Sarah Hartman, have conducted most of the fluoride-focused research. Undergraduate researcher Martijn Eikelboom (Wagneingen University) developed various locally-produced arsenic sorbents. We are excited that research fellow Álvaro Gutíerrez Berra and masters student Stephan Calvet (University of Edinburgh) have recently picked up the mantle of these research projects and will carry them through the end of 2018. All of this development is being overseen by Caminos de Agua’s Research and Technology Development Coordinator, Aaron Krupp. Upcoming research and pilot testing. Caminos de Agua has been working for four years to create a base bone char with a high fluoride adsorption capacity. The goal has been to determine the ideal production conditions (burn time, temperature, airflow, etc.) for a bone char with best possible fluoride adsorption capacity, then design a low-tech production process that yields this media. The process of pyrolysis, crushing, sieving, drying, and testing should be as easy as possible to replicate anywhere in the world. We began using a top-lit-updraft (TLUD) K-type gasifier based on Dr. Kearns’ designs in 2016 – see figure 1. This K-type TLUD does not limit the primary air intake as much as traditional TLUD designs. In doing so, it allows for more draft and significantly higher burn temperatures. One 55-gallon drum (the fuel chamber), with the bottom almost completely drilled out, is filled with wood scraps and raised off the ground – creating a significant primary air intake. Figure 1. K-type TLUD gasifier. First: Caminos staff cover the bone retort with the combustion chamber during a bone char burn. Second: TLUD-K bone char gasifier ready to be moved over to the second fuel chamber. A second drum (the combustion chamber) is placed upside-down atop the fuel drum on rails, creating a small secondary air intake and a chimney. The bottom fuel burns from top to bottom as the pyrolysis gasses rise into the upper chamber and combust. A smaller retort, filled with dried animal bones, is placed inside the combustion chamber. The retort, mostly sealed to prevent oxygen from entering, is cooked in the heat of combusting pyrolysis gasses. This carbonizes the bones that are sealed inside the retort. 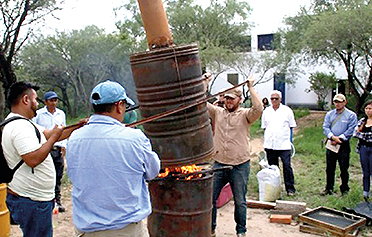 The chunks of wood burning in the lower drum fuel the process and are converted into a high-temperature biochar, Thus, the bone char production takes advantage of the excess energy created during the normal biochar production process. 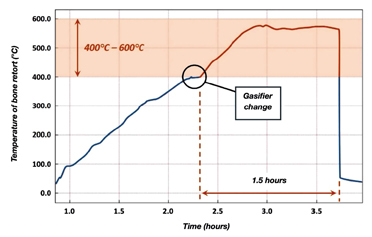 After much testing, it became clear that the optimal bone char needs to reach temperatures between 400ºC and 600ºC – but not exceed 600ºC – for at least 1.5 hours as shown in figure 2. Figure 2. A typical bone char burn. Displays the temperature recorded in the middle of the bone retort by a k-type thermocouple. The bones are held between 400 and 600°C for 1.5 hours. We found no significant improvement in fluoride uptake capacity between 1.5 and 5.5 hours. To achieve these conditions regularly, a bone retort must go through two subsequent wood char burns, transitioning quickly from one to the next. 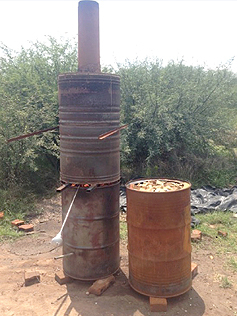 We are working on developing a larger-scale yet practical pyrolysis process for scaling bone char production. The bone char that emerges from the kiln is crushed and sieved to between a US standard #8 and #30 mesh (0.6 – 2.4 mm diameter). The char is placed in a large feedbag and crushed first with a manual earth tamper. These granules are crushed further in a handcranked corn mill. The resulting mix is sieved through both sieve sizes. Powder that passes through both meshes (<0.6 mm diameter) is reserved for other uses, but is too fine for column filtration. Losses due to these fines total around 45% by mass. Bones that have not been fully carbonized (still look, feel, or smell like bone) are discarded, as are discolored pieces. In a normal burn, these losses are minimal. Char that passes through the #8 sieve and but not the #30 is reserved for use in columns. Char the does not pass through the #8 mesh is crushed further. The particle size of 0.6-2.4 mm (mean 1.3 mm) is small enough to create a large, accessible surface area for binding fluoride. Particle size has been shown to be a critical factor in achieving a high fluoride adsorption capacity. 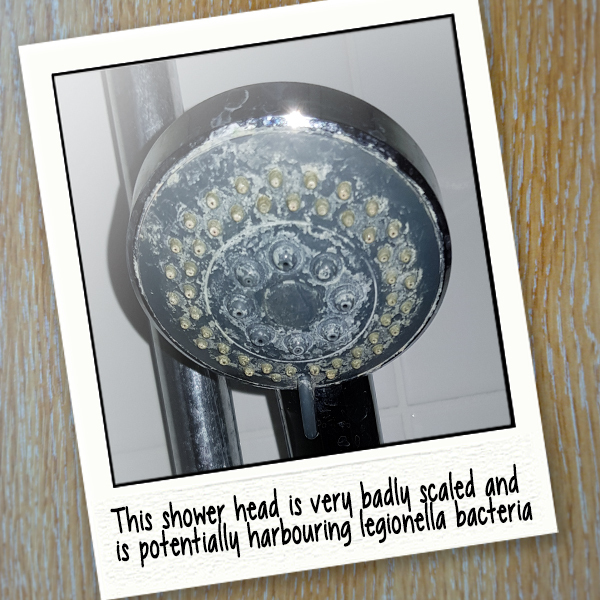 However, 8×30 particles are large enough to avoid physical fouling in a point-of-use, gravity-driven filtration system. The high-temperature (>850ºC) wood biochar created in the fuel chamber is a secondary byproduct of the bone char production process. It is useful for physical adsorption of synthetic organic chemical contaminants or as a soil amendment for agriculture. 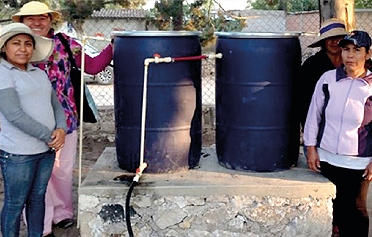 Caminos de Agua has built several biochar water treatment systems using this wood biochar as shown in figure 3. Figure 3. 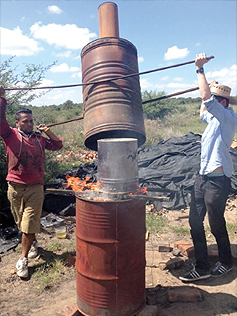 First: biochar workshop in a local community in northern Guanajuato, Mexico. Second: biochar treatment system installed in a local elementary school. 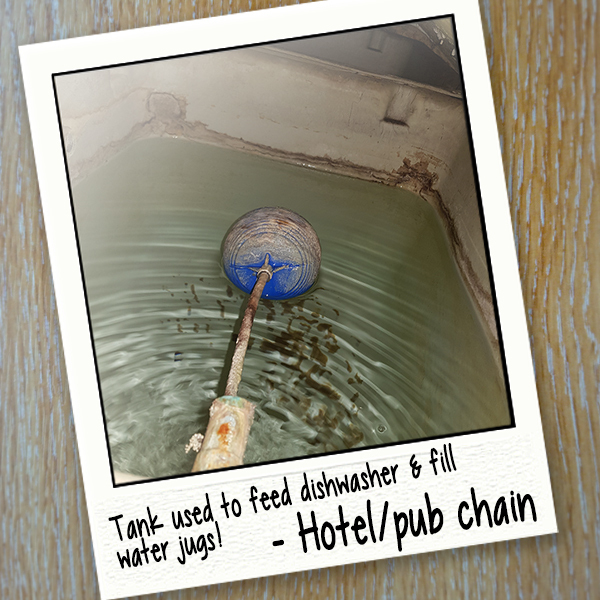 These systems typically remove residual chlorine at the point-of-use to eliminate taste issues in newly chlorinated sources. However, in general, these systems are more appropriate for surface water, where the biochar can reduce high levels of agrochemicals that often contaminate lakes, rivers, streams, and reservoirs. Additionally, due to its high internal surface area, we have begun impregnating this woodbased biochar with functional chemical groups to create an adsorbent tailored to remove arsenic. 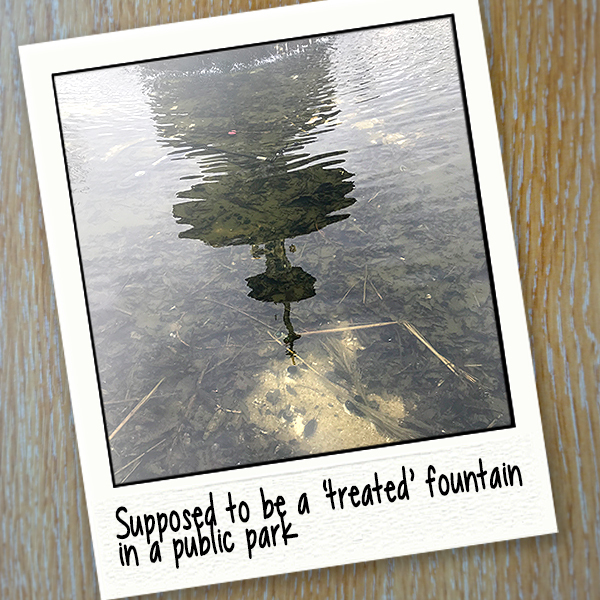 If this line of investigation proves successful, additional chemical treatments may be pursued to address other common groundwater contaminants. Whenever Caminos de Agua produces a new media or changes a production parameter, we verify the media’s quality in a number of ways. First, we run a twenty-four hour batch test to compare various materials. With those results in hand, we run gravity-driven column tests on the best performing media from the batch tests. Our most recent column data is shown in figure 4. Figure 4. Breakthrough of fluoride through an 0.7 liter bone char contacter. The star at around 200 bed volumes indicates where fluoride reaches the World Health Organization’s drinking water limit of 1.5 mg/L. Notice that without any other treatments before the bone char contacter, the fluoride in the filtered water reaches the World Health Organization treatment objective of 1.5 mg/L fluoride in about 200 bed volumes, or about a week producing drinking and cooking water for a family of five. We wet-sieve the media to a standard USA #8×30 mesh as described for the bone char, which yields about a 30% loss to fines. The sieved media is dried fully in the sun and packed into columns. Although we have gotten promising results from preliminary batch and column testing, we have not yet reached the saturation point on this product, so we don’t yet know its sorption capacity for arsenic with local water chemistry. We are excited to announce that we are beginning an arsenic remediation pilot this summer to get a more comprehensive understanding of the behavior of this product. While the bone char and Bayoxide E33 have both been tested independently and given positive preliminary results, we have also tested them together in a gravity-driven system. The design of the system is shown in figure 5 and the results in figure 6. 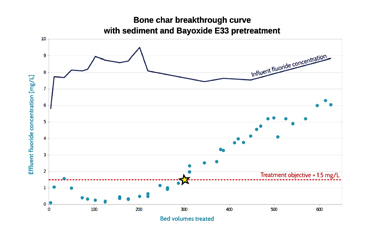 Notice how because of the pretreatment with a sediment filter and Bayoxide E33, the bone char lasts longer, extending its life from ~200 bed volumes (figure 4) to ~300 bed volumes, a 50% increase. For the duration of the experiment, there was no detectable arsenic in the filtered water and we expect the Bayoxide E33 to last much longer than the bone char for a given amount of media. Figure 5. 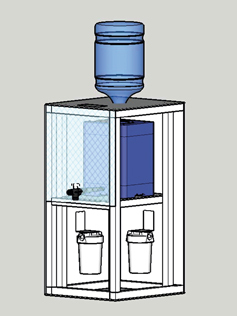 Schematic of the combined treatment system in the lab. The Bayoxide E33 removes arsenic while the bone char removes fluoride. Water is put into the elevated tank either manually or is pumped directly from a well. Additionally, this experiment was conducted with three different sediment filters to measure the impact of particulate fouling in the contacters. We tried an up-flow gravel filter, an IUSA 1939 130 micron disc filter, and a 10” spun polypropylene one-micron sediment filter. Figure 6. Fluoride removal results for the combined setup shown in figure 5. 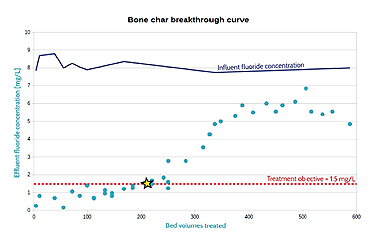 The star indicates that the treatment objective was reached at about 300 bed volumes, indicating a roughly 50% improvement over the bone char without pre-treatment (figure 4). For the entire duration of this experiment, arsenic was removed to below the detection limit of 2 ppb. Figure 7. 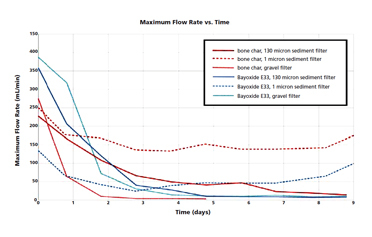 Maximum flow rates through the bone char (red) and Bayoxide E33 (blue) columns with three different sediment filters. 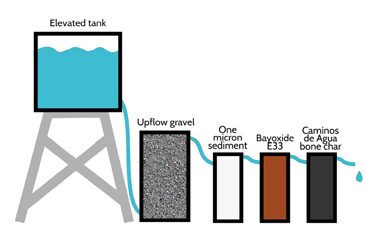 With both the 130 micron and gravel filter, the maximum flow rate approached zero, indicating physical fouling. With the one-micron sediment filter, the columns reached their equilibrium flow rates by the second day of the experiment and no further fouling was observed. As shown figure 7’s flow rate results, the columns fouled quickly with the first two filters, but the one-micron filter was enough to keep the maximum flow rate stable for the duration of the experiment. 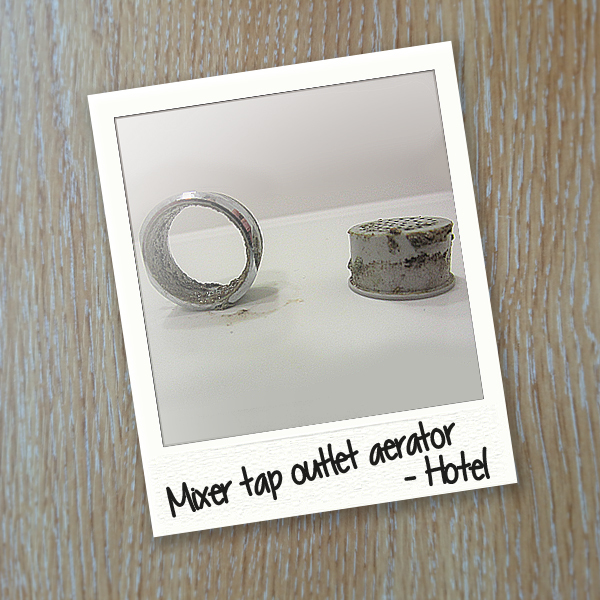 Our pilot, therefore, will incorporate a one-micron sediment filter before the contacters. Sodium hydroxide and ash treated wood char. Of all of these sorbents, the second – hightemperature wood char post-soaked in ferric chloride – demonstrated the best sorption capacity. Although the arsenic was reduced to no-detect in a column configuration, it broke through in about three days. Unfortunately, the cost per liter-of-water-treated of a media that we can produce locally is still far inferior to that of Bayoxide E33, so we plan to continue using the latter for our preliminary trials while actively continuing to research our in-house arsenic sorbent. 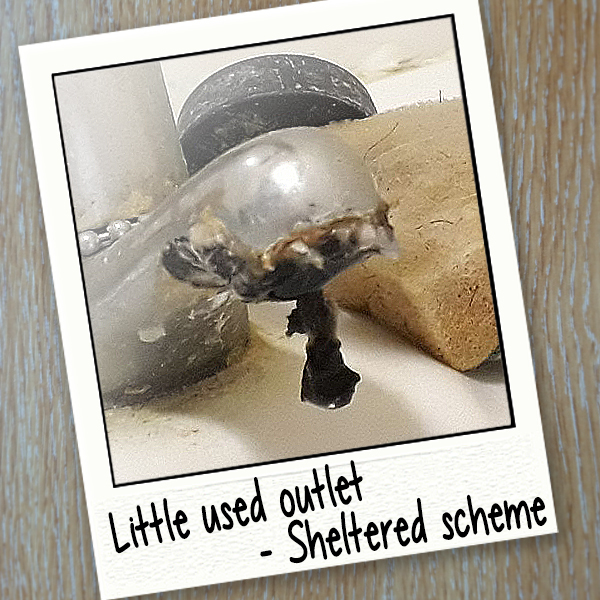 Research is currently being conducted by Matthew Polizzotto and Gabrielle LaFayette at the University of Oregon on the active ingredients for potentially regionally-relevant, low-cost arsenic sorbents. Future research will involve a full effort to develop our own, open-source arsenic sorbent for use in regional waters. Our in-house technical team is working on improving the sorption capacity of our existing bone char media. This follows on the research of Sarah Mitchell and Simona Dossi (Engineers Without Borders UK), and Sarah Hartman (research fellow). Stephan Calvet, a masters student at the University of Edinburgh, is working on other methods of activating bone and bone char for fluoride removal. This includes acid and base activation steps and the addition of other functional groups including calcium and aluminum. Figure 8. Lab-scale pilot systems designed and implemented to test the full-scale integrated system. 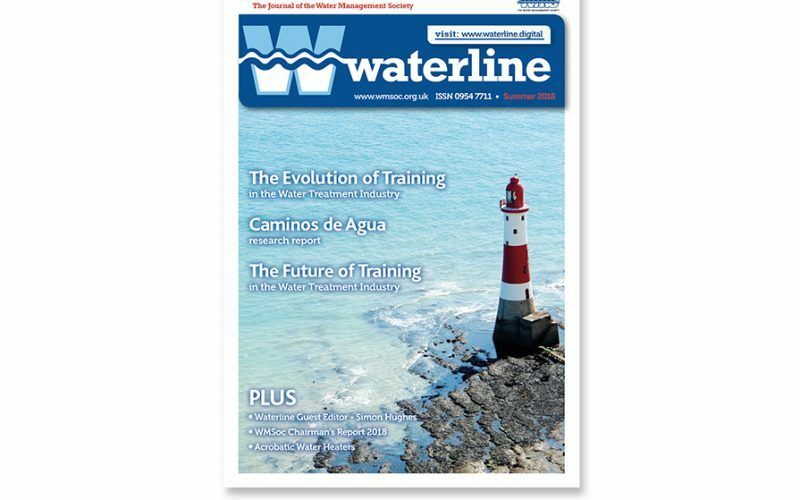 A household-scale groundwater treatment system distributed to key community partners with different inlet fluoride and arsenic concentrations. Treats 25 liters per day. One potential design by Sarah Mitchell pictured in figure 9. Figure 9. Initial fluoride and arsenic groundwater treatment system prototype – household scale. This couples Caminos de Agua’s ceramic filters with bone char and Bayoxide E33. These pilots will be gravity driven, will not require electricity or a constant water supply, and will follow the layout configuration in figure 5. We are excited to be starting the process of moving a technology from the lab into the real world, so that we can better support the organized efforts of the 680,000 people who are potentially exposed to dangerous levels of arsenic and fluoride in their drinking water. Caminos de Agua would like to especially and sincerely thank the Natural Health Research Foundation and Dr. Mercola for their continued support of this important research and development, which makes a substantial difference in the lives of real people. Without this support – and the freedom to explore unique solutions and follow the research where it leads us – none of this work would be possible. We would also like to thank Engineers Without Borders UK for ongoing partnership and for providing expertise and on-the-ground support through long-term placements who perform the painstaking research necessary to make these treatment systems deployable. 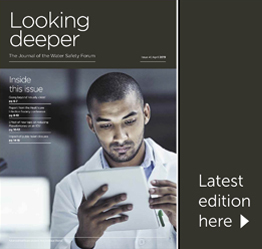 We would like to particularly thank Engineers Without Borders UK placements Sarah Mitchell and Simona Dossi who performed the foundational research that led to this report. We would also like to thank research fellows Sarah Hartman and Álvaro Gutíerrez Berra who have taken the research to the next level. Many thanks to Elena Diek and Engineers Without Borders UK volunteer Billy Thurston for putting in the initial legwork to get this research process up and running. Finally, we would like to thank Dr. Joshua Kearns of North Carolina State University (NCSU) for providing unparalleled technical guidance, frequent in-person support, and for sharing a worldview of providing safe and healthy drinking water – free from biological as well as organic and inorganic chemical contaminants – through affordable and scientifically proven solutions.